Speedway Sedans Western Australia have tonight released the grids for the 2018/2019 SSWA Junior Sedan State Title to be held this Saturday & Sunday Night at Attwell Park Speedway in Albany. 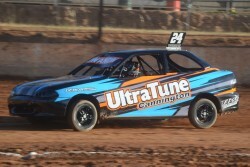 Fifteen qualifying heats will held on night before five more heats held before the finals on Sunday Night. Tyler Fraser will have the honour of starting the first heat on pole position. Blake Iwanow who was the fastest in official practice will start the second heat race from position four. Racing will start from 6pm Saturday & 5pm Sunday. Heat One, 8 laps: 1. W2 Tyler Fraser, 2. W8 Brody Day, 3. W22 Luke Malcolm, 4. W23 Hope Batchelor, 5. W34 Amber Shore, 6. W67 Nikita Donohoe, 7. W87 Riley Beaumont, 8. W117 Travis Strelley, 9. W166 Jacinta Lawrence. Heat Two, 8 laps: 1. W3 Summer Shore, 2. W9 Mitchell Baker, 3. W17 Cody Mackellar, 4. W24 Blake Iwanow, 5. W47 Rohan Thomas, 6. W73 Darryl George, 7. W88 Izzac Delaporte, 8. W118 Jade McKeagg, 9. W171 Kurtis Blackburn. Heat Three, 8 laps: 1. W5 Bronty Fraser, 2. W11 Erin Fraser, 3. W18 Hayden Mortimer, 4. W26 Jasmine Arnold, 5. W57 Brooke Sutton, 6. W75 Tylah Steele, 7. W95 Kayne Dellar, 8. W119 Joshua Ahearn, 9. W198 Brandon Buszan, 10. W177 Mitchell Delaporte. Heat Four, 8 laps: 1. W6 Rory Elsum-Beaumont, 2. W12 Jesse Steele, 3. W19 Bradley Short, 4. W31 Ethan Cooper, 5. W63 Bryden Southwell, 6. W77 Jarred Coutts, 7. W96 Izak Davies, 8. W121 Taj Vanzetti, 9. W187 Riley Hanson. Heat Five, 8 laps: 1. W7 Alex Swift, 2. W13 Elysha Cooper, 3. W15 Matthew Thomson, 4. W33 Olivia Smith, 5. W66 Seth Hinsey, 6. W84 Beau Oldfield, 7. W108 Blake Webb, 8. W133 Lexie Smith, 9. W295 Chloe Dellar, 10. W195 Lachlan Dellar. Heat Six, 8 laps: 1. W34 Amber Shore, 2. W87 Riley Beaumont, 3. W84 Beau Oldfield, 4. W166 Jacinta Lawrence, 5. W171 Kurtis Blackburn, 6. W198 Brandon Buszan, 7. W8 Brody Day, 8. W18 Hayden Mortimer, 9. W19 Bradley Short. Heat Seven, 8 laps: 1. W66 Seth Hinsey, 2. W77 Jared Coutts, 3. W88 Izzac Delaporte, 4. W119 Joshua Ahearn, 5. W187 Riley Hanson, 6. W295 Chloe Dellar, 7. W9 Mitchell Baker, 8. W17 Cody Mackellar, 9. W22 Luke Malcolm. Heat Eight, 8 laps: 1. W47 Rohan Thomas, 2. W67 Nikita Donohoe, 3. W95 Kayne Dellar, 4. W133 Lexie Smith, 5. W177 Mitchell Delaporte, 6. W2 Tyler Fraser, 7. W7 Alex Swift, 8. W15 Matthew Thomson, 9. W23 Hope Batchelor. Heat Nine, 8 laps: 1. W57 Brooke Sutton, 2. W75 Tylah Steele, 3. W96 Izak Davies, 4. W108 Blake Webb, 5. W195 Lachlan Dellar, 6. W3 Summer Shore, 7. W11 Erin Fraser, 8. W13 Elysha Cooper, 9. W24 Blake Iwanow, 10. W33 Olivia Smith. Heat Ten, 8 laps: 1. W63 Bryden Southwell, 2. W73 Daryl George, 3. W117 Travis Strelley, 4. W118 Jade McKeagg, 5. W121 Taj Vanzetti, 6. W5 Bronty Fraser, 7. W6 Rory Elsum-Beaumont, 8. W12 Jesse Steele, 9. W26 Jasmine Arnold, 10. W31 Ethan Cooper. Heat Eleven, 8 laps: 1. W23 Hope Batchelor, 2. W22 Luke Malcolm, 3. W8 Brody Day, 4. W3 Summer Shore, 5. W177 Mitchell Delaporte, 6. W119 Joshua Ahearn, 7. W118 Jade McKeagg, 8. W95 Kayne Dellar, 9. W67 Nikita Donohoe, 10. W34 Amber Shore. Heat Twelve, 8 laps: 1. W33 Olivia Smith, 2. W19 Bradley Short, 3. W9 Mitchell Baker, 4. W5 Bronty Fraser, 5. W171 Kurtis Blackburn, 6. W187 Riley Hanson, 7. W117 Travis Strelley, 8. W87 Riley Beaumont, 9. W73 Darryl George, 10. W47 Rohan Thomas. Heat Thirteen, 8 laps: 1. W24 Blake Iwanow, 2. W18 Hayden Mortimer, 3. W11 Erin Fraser, 4. W6 Rory Elsum-Beaumont, 5. W195 Lachlan Dellar, 6. W166 Jacinta Lawrence, 7. W88 Izzac Delaporte, 8. W75 Tylah Steele, 9. W57 Brooke Sutton. Heat Fourteen, 8 laps: 1. W31 Ethan Cooper, 2. W17 Cody Mackellar, 3. W12 Jesse Steele, 4. W7 Alex Swift, 5. W198 Brandon Buszan, 6. W133 Lexie Smith, 7. W96 Izak Davies, 8. W77 Jarred Coutts, 9. W63 Bryden Southwell. Heat Fifteen, 8 laps: 1. W26 Jasmine Arnold, 2. W15 Matthew Thomson, 3. W13 Elysha Cooper, 4. W2 Tyler Fraser, 5. W295 Chloe Dellar, 6. W121 Taj Vanzetti, 7. W108 Blake Webb, 8. W84 Beau Oldfield, 9. W66 Seth Hinsey. Heat Sixteen, 8 laps: 1. W295 Chloe Dellar, 2. W118 Jade McKeagg, 3. W119 Joshua Ahearn, 4. W73 Darryl George, 5. W75 Tylah Steele, 6. W26 Jasmine Arnold, 7. W24 Blake Iwanow, 8. W11 Erin Fraser, 9. W9 Mitchell Baker. Heat Seventeen, 8 laps: 1. W198 Brandon Buszan, 2. W121 Taj Vanzetti, 3. W117 Travis Strelley, 4. W67 Nikita Donohoe, 5. W77 Jarred Coutts, 6. W31 Ethan Cooper, 7. W23 Hope Batchelor, 8. W12 Jesse Steele, 9. W8 Brody Day. Heat Eighteen, 8 laps: 1. W195 Lachlan Dellar, 2. W133 Lexie Smith, 3. W108 Blake Webb, 4. W84 Beau Oldfield, 5. W66 Seth Hinsey, 6. W33 Olivia Smith, 7. W22 Luke Malcolm, 8. W13 Elysha Cooper, 9. W7 Alex Swift. Heat Nineteen, 8 laps: 1. W187 Riley Hanson, 2. W166 Jacinta Lawrence, 3. W96 Izak Davies, 4. W87 Riley Beaumont, 5. W34 Amber Shore, 6. W63 Bryden Southwell, 7. W19 Bradley Short, 8. W15 Matthew Thomson, 9. W6 Rory Elsum-Beaumont, 10. W2 Tyler Fraser. Heat Twenty, 8 laps: 1. W177 Mitchell Delaporte, 2. W171 Kurtis Blackburn, 3. W95 Kayne Dellar, 4. W88 Izzac Delaporte, 5. W47 Rohan Thomas, 6. W57 Brooke Sutton, 7. W18 Hayden Mortimer, 8. W17 Cody Mackellar, 9. W5 Bronty Fraser, 10. W3 Summer Shore. Photo, Blake Iwanow, quickest in official practice.